The overarching research questions of our group are (i) to identify novel therapeutic targets in cancer and (ii) to decipher the genetic and epigenetic mechanisms of oncogene regulation. Recent genome-wide studies revealed that the majority of the human transcriptome consists of non-coding RNAs, but their function and mode of action remains elusive. 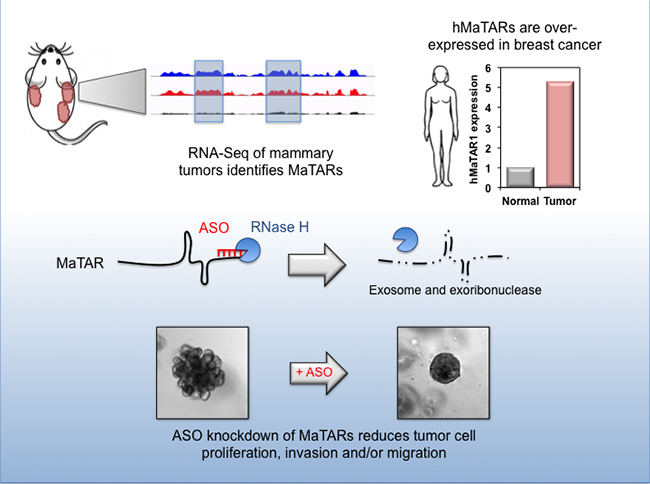 We recently identified and characterized 30 Mammary Tumor Associated RNAs (MaTARs) that are overexpressed in breast cancer. Notably, MaTARs are expressed in a tumor-specific manner, which makes them excellent candidates for drug development, as systemic therapeutic intervention will only affect cancer cells. In order to functionally assess MaTARs as key drivers of tumor progression, we performed antisense oligonucleotide (ASO) mediated knockdown assays of all 30 MaTARs in primary mammary cancer cells and 3D mammary organoids. Organoids represent an ex vivo model of mammary gland development and model branching morphogenesis in 3D culture, which is driven by two physiological processes: collective cell migration and cell proliferation. As the same processes also drive tumor progression, we utilize the mammary organoid system to model invasive breast cancer in vitro. Loss of branching was observed upon ASO-mediated knockdown of several MaTARs in organoids, indicating that these RNAs are drivers of mammary tumor cell proliferation and/or collective cell migration. Our current research investigates the role of long non-coding RNAs (lncRNAs) in breast cancer by combining bioinformatics, CRISPR/Cas9 genome editing and preclinical research using organoids and mouse models. In addition to translational research, we are also interested in studying the molecular mechanisms by which lncRNAs act in the cell.